Organic search engine traffic is the stream of (not paid search) relevant traffic to your website from Google, Bing, Yahoo, and other search engines, resulting from people's search queries. When someone opens their web browser, goes to Google.com and types in the phrase, “Gym in Dublin”, for example, Google will process the search and provide results based on what it thinks is the most relevant answer to the query. If I type “Health and Fitness Dublin” into Google what I am really doing is asking a question. Google interprets the search query as “Where can I find a Health and Fitness center that provides me with the best options based on my location and requirements?”. You might find it creepy that Google knows where you are, and even more unnerving tgymhat it understands who you are and what you are most interested in. That is exactly how the future of ‘search’ will evolve. Google uses data from your previous search history (especially true if you have a Gmail account or other Google service), your location, and many other factors to determine what results to show. New Fitness Blogger? Read our guide to starting a fitness blog for beginners. Visits to your site can also come from forum posts, email signatures, bookmarks, links from industry websites, and social media. Backlinks from local SEO directories can be very effective for getting targeted customers. However, if your business website ranks high in the Search Engine Results Pages (SERPs) it’s like opening the tap on an unlimited supply of free traffic. You don’t need to pay for the visitors that come from search engines. And as long as you maintain a good standing you will always have this traffic. The number of potential customers is dependent on the number of people searching. The more niche or specific your business the fewer the people searching for related terms on the internet. However, businesses with very specific services that rank high on Google will usually receive highly-targeted visitors from search. Let's look at an example. Imagine a London-based health and fitness business that wants to get organic traffic from Google and Bing. The business might expect that search terms like “London Health and Fitness” are what their potential customers type into Google. But this is a very broad term. Google.com's SERPs show hundreds of gyms, hotel fitness suites, swimming pools, Groupon offers, and health and fitness jobs relating to this search query. So it's clear that the business needs to concentrate on attracting a narrower slice of the market (to begin with, at least). Let’s look at how the business might offer some specific service to a sector of the public. Let’s presume that this business is a gym, based in West London, and offers personal training services to the over fifties age group. Now we have cut a smaller slice of the pie and should be able to target search terms related to this specific business. This is where SEO comes into play. SEO stands for Search Engine Optimisation and is the process of effectively influencing the SERPs so that your business ranks higher in Google for your target search terms. OK, What does that mean? Let's go back to the London gym example. The business owners want people in their fifties based in West London to find their gym. So they should optimise their website for higher ranking in Google's search results for keywords relating to this criteria. Optimising the website for topics based on search terms such as “over 50s fitness London” or “west London gym personal trainer overs 50s” is a good start. These are just examples but it helps to illustrate a point. I use the first two tools on a daily basis. Of course, there are free keyword tools such as Google Keyword Planner (GLP) but you won’t be able to see the competitiveness of each keyword using this tool. And just recently Google changed how the results are displayed. Now you must have a minimum (fairly high) spend on Google Adwords to get access to exact search volumes. For now, it’s a great tool for starting a search but it’s quite limited. Once you've decided on keywords for health and fitness and topics that will help boost your ranking, what's the next step? Content. Yes, writing blog posts about your specialist topic is the best way to move the needle in terms of obtaining high-quality long-term traffic. Many SEO professionals will tell you that getting links from other sites is the number one way to grow your website and I won’t deny that it’s very, very effective. However, all links are not created equal. Many businesses have created extremely successful websites that are low on links but high on quality content. And finally, there are some signs that Google might be giving backlinks less of a priority moving forward. Figure out what your time is worth. Will it take you a day to write a 1500 word article? You might think that this is a waste of time and that paying for Google Ads is a better use of limited resources. But remember that you’ve probably already put in the hours to make the (taxed) revenue which pays for this type of advertising. And once the ads have run their course and Google or Facebook takes your money the traffic dries up. Is it worth spending on ads now? Content marketing will serve your business better in the long-term. And the more time that the piece of content has been on your website the better. It must be said here that this content should be updated if anything changes and it must have value to your potential customers. 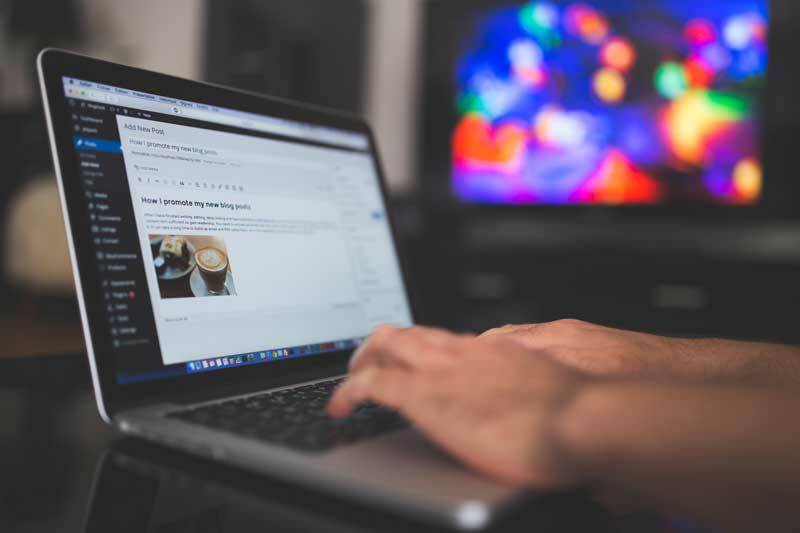 Blogging connects you to your customers. SEO pays off in the long term. That’s not to say that all other forms of traffic generation have no impact. They certainly do. Facebook ads, in particular, can be extremely targeted and very cheap. But you still need to pay for each click and once you stop paying, well, the traffic is gone. So what should you write about? First of all, decide on the types of clients that you want. Next, decide on what you’d like to write about. Finally, perform keyword research based on search volumes and competitiveness, and evaluate potential topics. At the intersection of all three, you should find topics to put down on paper (or blog posts). The manager of a gym in New York wants to attract young professionals with high disposable income to start training at his facility. The first thing he does is find out what gym-going young professionals are looking for. What kind if fitness trends are they interested in? 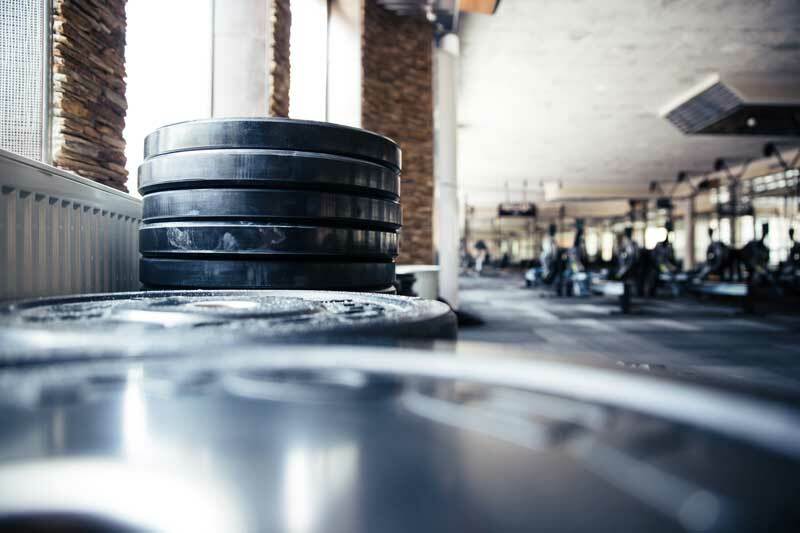 The gym manager researches the market using keyword tools, forums, articles, email marketing, and analytics tools. He discovers that this section of the public is looking for personal trainers in New York. There are plenty of people searching on Google for “personal trainer NYC” and the competition is not too high. (Competition factors relate to how well other companies are marketing to people searching for this keyword). Fortunately, his gym offers personal training sessions and has several qualified Fitness Instructors who provide PT sessions to clients. The manager then sets about writing about the Personal Training sessions at his New York Gym. He details the benefits of working with a PT. He gives examples of clients that have paid for the service and experienced great results. To finish off the gym manager adds a video of a typical session at the gym and maybe an infographic explaining how personal training benefits young busy professionals. The example above is one way the owner of a business in the health and fitness niche could/should market their business online. Of course, not everyone wants to do the research and writing but that’s where a digital agency can help. 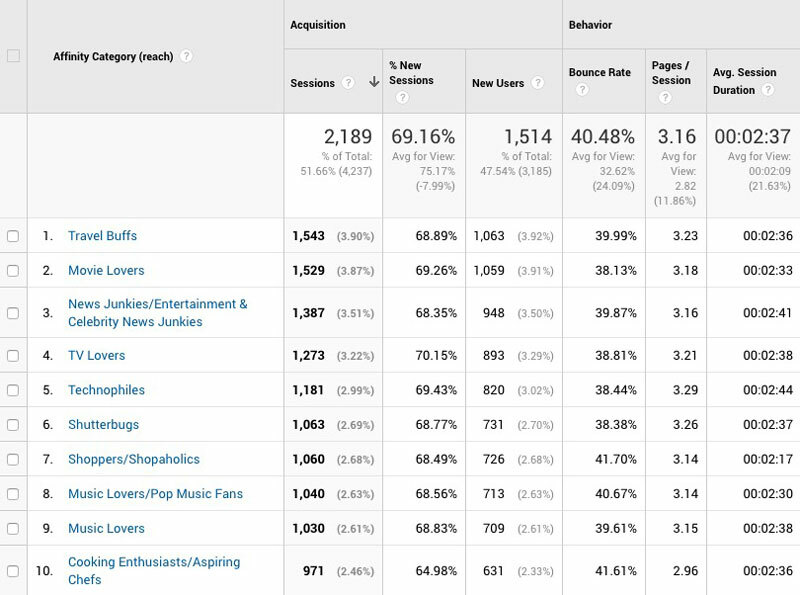 You will need to have some regular traffic to your website already for this information to be useful but look at Affinity Categories for information on users' interests and overall lifestyle. In-Market Segments refers to what people are looking for. This category gives you an idea of what your potential customers are actively involved in researching, with the aim of purchasing. Finally, have a killer website that is fast! I’ll emphasise that last bit. Have a fast-loading website! This is crucial. Sliders, fancy images, and embedded videos are all well and good but can slow down your site. Badly built themes can also look amazing but perform poorly. The only way to know this is to run some analytics software. Go to any site like TemplateMonster and you will find hundreds of themes that cost very little. But I do not recommend these templates or themes for any serious commercial website. The downsides far outweigh the upsides. Unfortunately, most people never realise this and blame poor search engine results on other factors. A good website is a crucial part of SEO. Build a website with SEO in mind. Websites without plans are more likely to fail. The structure of your site should be something you consider before starting, not during or after construction. Find someone who knows how to write for the web, understands marketing, and has a good understanding of your niche. A fitness copywriter or health blogger would be ideal. Or hire a professional digital marketing agency with fitness marketing skills. With Google's August 2018 update, marketing in the health and wellness niche has gotten a little harder. Authority, Expertise, and Trust are the new buzzwords in wellness marketing as businesses try to improve quality and reach. But if you follow the best practices laid out below, you'll have a better chance of beating your competitors and staying on Google's good side. Here are some examples of local business offerings. Largest selection of yoga classes for women in your local area. Avoid trying to advertise to everyone. Attempting to appeal to everyone will result in failure, unless your business is Facebook. Try to narrow down on a demographic and focus on pleasing this subset of the market. A few people raving about your product is better than lots of people quietly using your product. Let's say you have an online course on Paleo diets and you also run a meditation course. Don’t mix products in one ad space. Don’t even write about them in the same blog posts. Keep everything separate. Maintaining distinct products and offerings is part of “silo” theory, much discussed in SEO circles. Categorizing concepts and related products (and keeping content in these categories apart from each other) helps Google better understand your content. Many health and fitness business owners write about the same topics on every blog post and product page. The problem is that Google's algorithm can't determine which page should rank in the search results for different keywords. If all pages use the same key phrases, Google can't choose one as the best to answer a customer's question. This situation is called keyword cannibalization and results in lacklustre performance for the website in search engines. In the days of print media for marketing, it was much harder to tell what worked and what didn’t. These days, online marketing technology makes tracking and optimising easy and effective. We can now test variations of headlines, images, and copy in advertisements and blog content. We can even test different variations in blog posts. Imagine if you could write 10 different headlines and track, based on each headline, the average click-through-rate and reading time. Wouldn't that data be valuable? You can do that with the right marketing tools and knowhow. Try to promote the fact that your services ARE different. If you try to be generic, appeal to everyone, and emulate your competitor’s offers, effective marketing will be much harder. Here are some questions to think about. What’s unique about your business? Try to find something that resonates with people. Do you have a dog-friendly gym? Is your eCommerce store the only one that has 24-hour customer service? Is your online yoga course the only one run by an ex-accountant? Writing great copy can be the difference between a successful marketing campaign and a disastrous one. Well-written website copy helps clients understand what you can do for them. Good writing should be concise – It should tell a story in as few words as possible. The copy should sell the product (there are always details to consider. But clients should have made their minds up to buy). Send the wrong message and people won’t buy. So, learn to write perfect headlines, call-to-action, and sales pitch and you'll crack the marketing code. Great copywriting can make a good offer irresistible. For brick and mortar businesses, local SEO should be top of your list. Your business is missing opportunities if it's not well-represented on Google My Business, Google Maps, and Facebook business pages. When customers search for your business name, you want them to see your business first on Google Maps or Facebook's search results. And you get there by having 5-star reviews. Step one is to make sure your local yoga studio, gym, wellness centre, or clinic has a Google My Business, Yelp, and Facebook listing. After that, you can move on to other platforms. Next, make it easy for people to review your business. Providing an amazing service will get you amazing reviews, but you can help the process along too. With better reviews come higher rankings in local search. With a perfectly executed marketing plan, your business could appear first in the Google search results in both the ads and organic listing, and have the first position in local business listings across platforms. The chances of someone clicking your links increases dramatically. If you offer a premium service, be careful with discounts. Many niches in the Health and Fitness business category perform better (from an ROI perspective) at the premium level. Discounts often send negative signals. They can be a low-quality indicator. Free trials and testers are good for testing the waters. Introducing people to your product opens up new opportunities. But avoid heavy discounts on your services or you’ll risk getting the wrong kind of customer. Use chatbots for discount offers. Chatbot technology has reached the point where bots can take over a lot of the repetitive tasks of humans. Answering simple questions and offering discounts based on user answers can be very effective. Chatbots can take care of this entire process. Google's Ad network, Facebook & Instagram Ads, Pinterest Ads, and Twitter Ads are all legitimate ways of getting paid traffic to your website or call-to-action. Each ad network has its own advantages and disadvantages and which you choose will depend on your offer. Google Ads are for advertising services or product types that people are already aware of. That does not mean you can't use the services if your business is new. Adwords are great for putting your message in front of people that search for products and services in Google. If your gym business offers spinning classes, use Adwords to bid on keywords like “local spinning classes”, “spinning class near me”, “spin class New York”. When someone uses these search terms (or similar terms) in Google, your ad might appear first (an ad's position depends on the quality of the keyword, ad copy, offer, and landing page). The Google Ads network is not the best channel for selling an “unknown” service, product, or business. If people don't know it by name, they won't search for it on Google. You might find it hard to get results on Google Ads if you only target the name of your product (unless you're Nike). If you can target keywords related to the niche or category, that's better, but it could work out expensive. Facebook Ads are effective in the hands of a professional advertiser. For the inexperienced, Facebook ads can also be a colossal waste of money so it pays to seek advice from someone who understands the ad network. But Facebook has restrictive policies that might cause you problems. The health & fitness niche is an industry with tight advertising policies and regulations (created by the advertising platforms and government authorities). Facebook is strict about ads that mention particular demographics in the text or show before and after images (in the weight-loss category, for example). If you make claims in your advertising that your product changes physical appearances or helps people lose weight, Facebook will block your ads. Learn to use the right channel for marketing your business. Create unique products and track advertising and marketing costs. Use data to find the best performing channel and double down on that. Keith is the founder of Fat Frog Media. 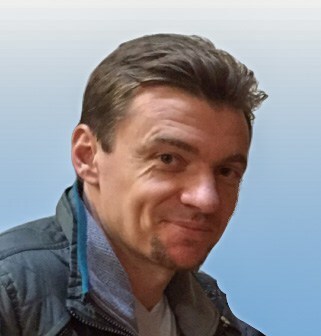 He has worked in the tech, fitness, food, and hospitality industries. Keith helps businesses improve their marketing and conversion rates. Wow! 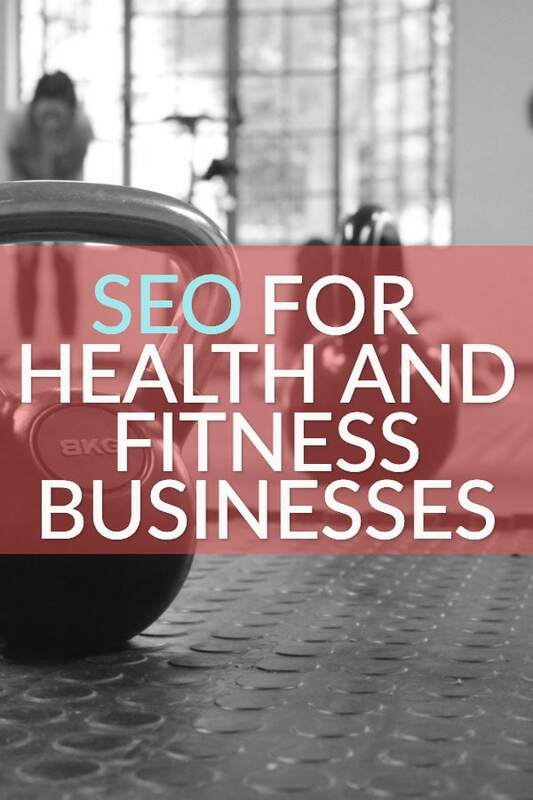 Great article on SEO for Fitness! Much appreciated the uniqueness and detail to it.